For two weeks every four years, the media and the politicos gather for the insider’s ritual of selecting a presidential candidate. Really, it’s an opportunity for them to party, schmooze and show the special interests, who support their cause, a good time. The role of the citizen in these pageants is, at best, as passive consumer. So, what happens when you toss in a pair of citizen reporters, and put them on national television asking the one question that conventioneers don’t want to answer: What are you doing to get money out of politics? The first experiment will be a series of reports from the Republican National Convention in Tampa, Fla., August 27-30 and the Democratic National Convention in Charlotte, N.C., September 3-6. The past months have been spent locating partners and finding potential reporters. We are creating a process that will reveal whether the citizens’ voice can make a difference in the national dialogue, even — especially — when the political and media powers want to ignore what the people have to say. But first, we had to find and train the reporters. We realized early on that only by combining outreach to a significant number of people with the leveraging power of national television broadcasting could we hope to find our citizen reporters. First, Link TV, the national non-commercial television channel committed to informing Americans about the world, was willing to take the chance of putting real citizens on TV. In many ways this is the boldest move of all, and it had to be a small, independent and feisty channel like Link that would be willing to run with it. 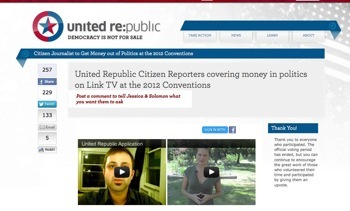 Next, United Republic, whose mission is to address the corrupting political influence of money and has more than 250,000 subscribers, jumped on board. We used an app adapted from the Personal Democracy Forum’s 10questions.com that allows people to post, rate and share videos. 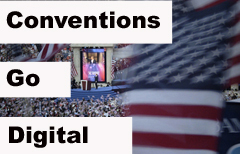 The app was embedded on a United Republic page, and scores of aspiring citizen reporters posted and promoted videos of themselves, telling us why we should send them to the 2012 Conventions. But trying to find citizen TV reporters posed serious unknowns. We don’t know of any previous attempt to use social networking to surface potential citizen journalists for a national broadcasting outfit. Would anybody show up to post videos? Would those who did post videos “work” on TV? And, could citizen journalism go big time? A key part of the deal is that they will be trained by our staff, led by radio and TV producer Shia Levitt. 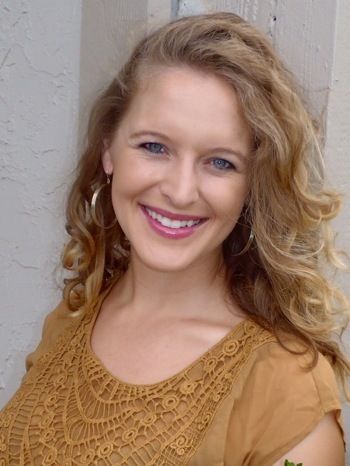 Her goal is to help them walk the razor’s edge between legitimate citizen outrage and productive reporting. They are studying up on the issues for the 3-hour training, which will range from practicing stand-ups to the art of asking civil questions to the secrets of follow-ups. Levitt will only know if her tutelage worked when we get to the convention floor. In fact, for all the ballyhoo about “citizen journalism” and “engagement” over the last few years, there’s precious little to show for it, on the page or on the screen. Some bloggers have risen to prominence as journalists, and all bloggers are in one sense crowd-sourced, becoming representative voices for a point of view shared by many. People do vote with their clicks, alerting journalists to what the crowd finds of interest at any given moment. But the very nature of this process ensures that fleeting interest is made much of, while enduring interest — the many clicks scattered among cat video likes and satirical tweet shares — is lost even to the most attentive observers. No wonder media coverage has degenerated into flashes of scandal and outrage at the expense of the larger issues people insist they care most about. Nonetheless, we are very clear that the mission of Digital Citizen — to expand the voice of the citizen in policy dialogue for the digital age — is more than fulfilled by the issue of the corrupting influence of money in politics. As Steven Dikowitz, one of our competitors and a member of our Citizens’ Editorial Board put it, money is “the elephant in the room” where media and politics intersect. A July 2012 Gallup Poll revealed that reducing corruption in the federal government was second only to focusing on jobs among Americans’ concerns. So we are focusing on a subject that is owned by the people. After all, politicians who live by donations are not likely to meaningfully confront the issue without public pressure, and the public has a shrinking number of avenues+ through which to address their elected representatives, despite the growing list of complaints. Nor can most journalists, who must be careful what they ask lest they get blackballed by politicians or, worse, censored by the huge media corporations they work for (which reap tremendous benefits from the campaign finance system), be relied upon to push the issue. Thanks to the Supreme Court’s Citizens United and related decisions, combined with the politicians’ reluctance to reveal the fonts from which their campaign financing flows, there is no good way to source money in politics. But if you “follow the money” as to where most of it flows, you find yourself at the door of the media. A May 2012 investigation by the Columbia Journalism Review took a hard look at the recipients of this largess. By law, “the campaigns get the lowest rates in a given ad class, [but] they do tend not to buy the cheapest class, which is subject to ‘immediate pre-emption,’” while Super PACs and issue groups, “are not entitled to the same low rates.” It all adds up to a bonanza — the article quotes industry estimates that “$2.5-$3.3 billion will be directed to local spot advertising” — a new record. This is quite an incentive to forget to question the campaign finance system. With only four days until the Republican Convention begins, our reporters are tanned, rested and ready to march into the maw of the prime-time Conventions extravaganza. We, the production team, are exhausted, hurried and worried, up to our eyeballs in logistics, stretching our dollars until they squeak. We hear there’s a hurricane heading for Tampa and are packing our camera raincoats. But it’s worth every bead of sweat and storm-surge: We are using the lure of appearing on TV to find new journalists who have no stake in the system as it is. Because they represent the many people who have nothing to lose but the integrity of their leaders, we hope to leverage this issue into national prominence. 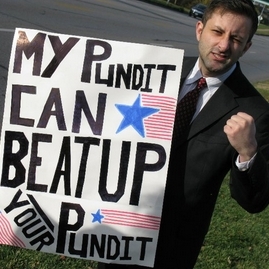 So, while other TV journalists at the conventions will be on the lookout for scandal and bombast, the Link TV Citizen Reporters will be more interested in the special treatment of special interests, the workings of Citizens United and Super PACs, the costs and tolls of attack ads. Will 2012 prove to be the year that citizens gain a stronger voice in the policy dialogue that shapes our nation? Stay tuned. Evelyn Messinger (@citizenschannel) is president of Internews Interactive. She is a television and Internet producer, and a pioneer of citizen engagement projects that define the parameters of digital connectivity. Her credits include daily news, features and documentary programs for the BBC, Link TV, PBS, PTV stations, CNN and others. Ms. Messinger is a co-founder and former executive director of Internews Network, an international media NGO.